When I heard that the world’s fastest roller coaster is building I was sure it is in Abu Dhabi. It will be the next huge addition to the UAE sightseeing map after the world’s tallest building. Be sure to take a helmet, because you will be sitting in a real beast of a car! Two roller coasters are being built right now. They will both have two parallel tracks to simulate a race between two cars. 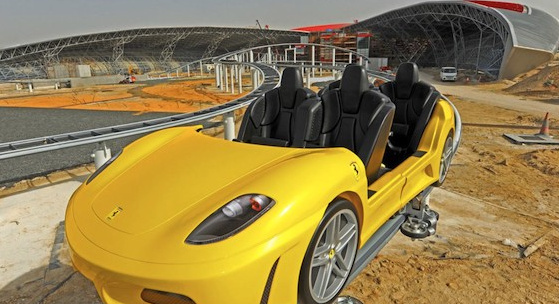 The first attraction is a coaster for the Ferrari World theme park, which will use Ferrari replicas with four seats for the racing simulation. But this is just the runner-up. The F1 is world’s fastest roller coaster, where the cars will be able to speed up to 240 km/h. It is supposed to be ready just before the next Abu Dhabi Grand Prix. Wow, indeed. I’ve already started saving money for a trip to UAE to check out those babies myself.